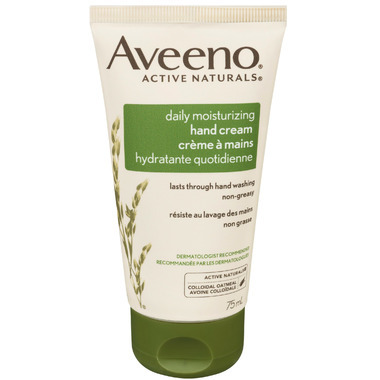 With Aveeno Daily Moisturizing Hand Cream, your skin and hands will feel smooth and soft. Formulated with natural oatmeal and rich emollients to relieve dry skin and form a protective glove against the elements, this highly moisturizing cream forms a protective barrier to help relieve and prevent dryness. This colloidal oatmeal formula hydrates your dry skin and hands for 24 hours and even lasts through hand washing. This non greasy cream will leave your hands softer, smoother and healthier looking all day long.